The feast of the Assumption seems a good day to promote devotion to Our Lady of Good Success. A reader kindly sent me the DVD, "Our Lady of Good Success: History, Miracles, Prophecies" produced by Pro Multis Media. In recent months, I have received several other items related to this devotion. There is a good website run by "Tradition in Action" which has a "Basic Questions" page by Dr Marian Therese Horvat who wrote the book "Our Lady of Good Success. Prophecies for our Times." Another dedicated website, Our Lady of Good Success has various articles and photos, from which the above is taken. The first question any good Catholic will want to ask is "Is this devotion authorised?" The answer is unambiguously affirmative. It was approved in the 17th century by the local bishop and has been supported by his successors. Pope John Paul authorised a solemn public coronation of the statue. Our Lady appeared to Mother Mariana de Jesus Torres (1563-1635) at her convent in Quito, Ecuador. Her cause for canonisation was introduced by the local Bishop in 1986. It is particularly interesting that during the apparitions, Our Lady made a number of prophecies which have subsequently been fulfilled. She spoke particularly of the crisis in the Catholic Church during the 20th century. She also spoke, as at Fatima, of her subsequent "triumph" after a period of purification for the Church and the world. 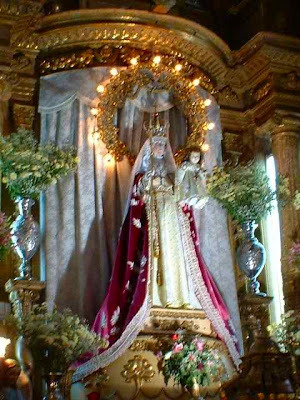 Our Lady told Mother Mariana that the devotion would become widespread in the late 20th century. Until then, it was virtually unknown outside Ecuador. 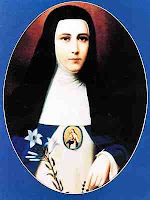 There is a good article at Blessed Virgin Mary's Bower on the life of Mother Mariana. The "good success" originally referred the happy development of Christ in the womb of Mary from conception to birth. It was extended to include our Lady's mediation and intercession in time of particular need. For our own time, it can be understood particularly to refer to Our Lady's motherly protection of the Church. Our Lady of Good Success. Pray for us.